The Mennonite Heritage Village is just outside Winnipeg in Manitoba, Canada. On this 40-acre site, visitors can explore a traditional Russian Mennonite village and learn about the history of the Mennonites in Canada from the 1600s through the present day. The village itself is representative of the 1800s. Inside the village there are two schools, a barn and animal pens, a grainery, printery and two general stores, blacksmith shop, two churches, a windmill, an antique tractor display, and various other artifacts of life at the turn of the century. Maps are available for self-guided tours of the site. There are also three galleries on site, which host both permanent and traveling exhibits. In the permanent collection are artifacts that trace the history of the Mennonites from the 1500s to the present day. Artifacts include everyday objects such as a child’s crib and toy bear from the early 1900s, traditional Mennonite head-coverings for both men and women, and cooking utensils. Unusual objects include a geomancy notebook, which is a particular form of fortune-telling notebook used in 1882. It is suggested that visitors allow for at least 2 hours to visit the entirety of the village, the exhibits, and collections. 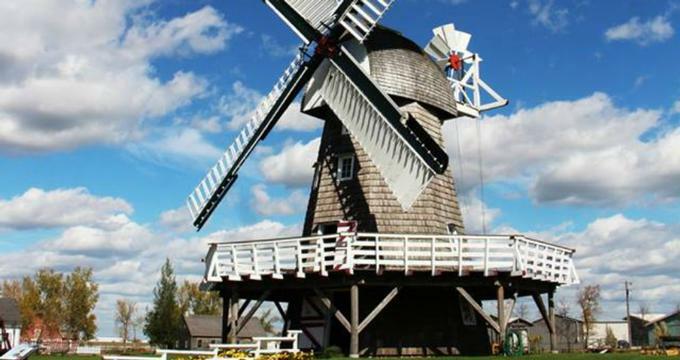 The windmill is perhaps the most famous feature of the village, a 2001 reconstruction of an 1877 windmill – and is the only operating windmill in Canada today. With 60-foot sails, the windmill stands tall over the village and is the central feature of the Structures Program, one of the educational programs available to visiting groups. Mennonites first arrived in Canada around the time of the American Revolution, encouraged by the prospect of inexpensive land. The first Mennonites in Canada were German-speaking Swiss who immigrated by way of Pennsylvania. The largest migration of Russian Mennonites occurred in the 1800s as groups arrived to settle two large land reserves set aside by the Canadian government. A second wave of Russian Mennonites arrived around the time of the US Civil War and Russian Revolution in the mid-1900s . As pacifists, the Mennonites were seeking to avoid persecution for not having fought in the wars. The Mennonite Heritage Village was established in 1957 and today is one of the largest tourist attractions in the area, with thousands of visitors passing through each year. In addition to the village, the grounds bear a large monument to victims of war, terror, violence and anarchy, as well as a plaque officially designating the site as a Historic Monument of Manitoba. Tours of the village are self-guided, but the village does offer several educational programs for school groups and school-aged children, including guided group tours, interpretive summer programs, day-care, hands-on programs, and middle-school curriculums. Summer programs are for children in grades K through 6 and offer full-day options of either interpretive or hands-on experiences. Summer activities may include observing the miller working at the windmill, watching the blacksmith make nails or horseshoes, or taking a horse-drawn wagon ride. Winter programming is similar, but activities occur indoors and may include baking traditional biscuits, learning to use wood-working tools, spinning wool and braiding rugs, or learning to write with a quill pen and ink. Social studies curriculums are available for middle-school teachers and meet the requirements of the Manitoba curriculum and Canadian Learning Outcomes. The village is home to a permanent collection, but hosts temporary exhibitions as well. Up until April 30th in the Gerhard Ens Gallery there was the Beyond Tradition: The Lives of Mennonite Women exhibit, celebrating the 100th anniversary of women’s suffrage in Canada by looking at the lives of Mennonite women who stepped beyond the role of wife and mother and sought careers, leadership roles in the church, and agency over their lives as immigrants. Upcoming exhibits will explore more closely the role of the Suffragist movement and the historical context in which women won the right to vote. Past exhibits include Mennonite Food: Tastes and Tradition, which depicts the changing traditions around food within the context of Mennonite influence on Canadian culture. The Livery Barn Restaurant offers onsite dining, but may itself be considered part of the exhibits. All dishes on the menu are from traditional Mennonite recipes, with German and Russian influences, and guests dine in a pioneer setting. Lunch is available weekdays, and on weekends there is a buffet brunch.